If you were to guess what an insectivore eats, what would you say? If you said insects, you are partially correct. Different species will dine on plants, fish, frogs, crabs, eggs, scorpions, and yes, insects. Insectivores usually have long slender noses and an excellent sense of smell. Hedgehogs have excellent hearing. Our lesser hedgehog tenrecs (Echinops telfairi) are used for mobile zoo programs and are favorites of our volunteers. They look like a hedgehog, but they are not. Tenrecs can roll into a ball like a hedgehog, but the muscles controlling their spines are not a specialized. Tenrecs are slightly smaller than hedgehogs and have a short tail covered with spines. If rolling into a ball does not keep a predator away, the tenrec goes on the offensive, charging at the intruder with their teeth bared. 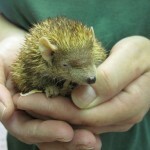 Don’t upset a tenrec! The African pygmy hedgehogs are also used in our mobile zoo programs. Their bodies, except for their faces, are covered with spines. Besides serving as protection against enemies, spines act as a cushion when the hedgehog falls or drops deliberately from a height. They have 36 teeth for eating frogs, invertebrates, snakes, lizards, and young birds and mice. Actually they will eat nearly anything, including carrion.